Welcome! The purpose of this blog is to investigate interdisciplinary perspectives on issues of communicating across difference as they relate to the teaching of language and composition. If this is your first time visiting the Annotation Station, you can orient yourself more quickly by knowing I view issues of language, identity, and literacy as ideological issues (rather than neutral), multiple (rather than singular) and fluid and dynamic (rather than fixed and static). I am therefore very interested in translingual, transmodal, transcultural, and transnational communication practices with a critical eye to how power discrepancies shape these issues. Feel free to use this blog as a resource if it meets with your own research and teaching interests, and definitely use the comments feature to suggest any connections and insights of your own. Agar, Michael H. The Professional Stranger: An Informal Introduction to Ethnography. 2 ed. Bingley, UK: Emerald Group Publishing, 2008. Based on ethnographic research experience in India, among street junkies in the US, and a team ethnography in Switzerland, Agar demonstrates that ethnographic traditions are currently relevant and the idea of fieldwork more complicated by recent theories such as network theory. 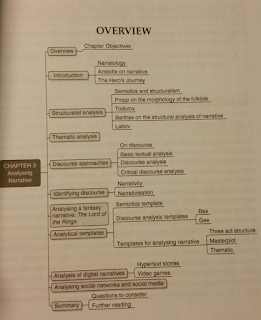 He proposes that the ethnographer should be moving from description to analysis to interpretation. The ethnographer must account for context and meaning while keeping an eye also on power. Positivism is not appropriate, but systematic methodology is important. In this sense, he recommends an informal-to-formal funnel sequence and moving from a child-apprentice role to a more detached scientific view that can give an account of how locals interpret their own lives. He sees ethnography as a dialectic process and cross-culture perspective in which researchers' attitudes toward culture "color" the evaluative tone. In addition, nearly all ethnography will include both aspects of emic and etic observations by analogy from linguistics where "phonetic represents the set of possible distinctions that might be used in the characterization of human speech, while phonemic is the subset of those distinctions useful in describing the sound differences that are perceived as significant by speakers of a particular language" (238). The ethnographer should search for patterns, rather than enter with pre-planned hypotheses. Searching for patterns that are significant to give an account of a local culture are the main premise of ethnography. Geertz, Clifford. Local Knowledge. New York: Basic Books, 1983. Geertz writes that "life is translation and we are all lost in it," proposing that ethnographers should seek to see through glosses, not behind them (49). He describes the process of gaining insider perspective or ownership, transformation, or construal of the imaginational as changing the immediacies of one form of life into the metaphors of another. He calls this cross-cultural and cross-historical accessibility where "the deeply different can be deeply known without becoming any less different; the enormously distant enormously close without becoming any less far away" (48). He calls for "continuous dialectical tacking" between the local and global simultaneously where the whole and parts and conceived through each other, which seems to be a nod towards a form of collaboration between ethnography and narrative research (69). He refers to experience-near and experience-far concepts with the ethnographer needing to oscillate between the two (58). The realistic and appropriate goal of the ethnographer is to be able to construe modes of expression or symbolic systems (70). He draws attention to convergent data, showing how the anthropological focus on "groups of people engaged with one another in multiple ways, makes it possible to turn what looks like a mere collection of heterogeneous material into a mutually reinforcing network of social understandings" (156). All these thoughts support a picture of what he calls interpretive ethnography, which acknowledges the role and perspective of the researcher in ethnographic work. It is not possible to present an objective form of understanding of a group of people, but neither is it useful to accept relativism as a paralysing force. It is most important to recognize what the differences and similarities reveal or make possible to know about being human and how positionality and experience-distance offer new perspectives and forms of action. Alleyne, Brian. Narrative Networks: Storied Approaches in a Digital Age. Los Angeles: Sage, 2015. 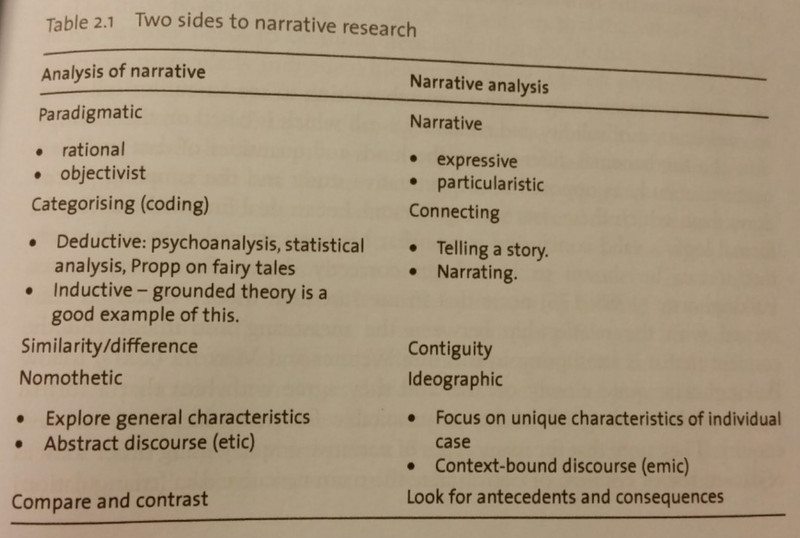 Both types of analysis may be present in a single study, but the researcher should clarify the role of each type. Methodological issues include moving between the general and the particular, validity, and reliability. For movement between general and particular, comparisons to other studies should be considered. 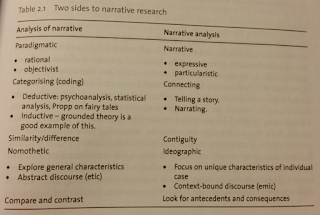 For the second, Alleyne points to how problematic traditional approaches to these can be for narrative research and proposes instead Webster and Mertova's suggestions with principles of access (of others apart from the researcher), honesty, versimilitude, authenticity, familiarity, transferability, and economy (52-53). This book provides many tools for researchers interested in expanding narrative research to digital platforms, genres, and contexts. Awang Chuchu, Dayang Fatimah Haji. Code-switching in a Mutlilingual Environment. Perak Darul Ridzuan, Malaysia: Universiti Prendidikan Sultan Idris, 2007. Awang Chuchu draws on Gumperz's definition of code-switching to draw attention to switching within a language, rather than just between languages. The key definition is "the juxtaposition within the same speech exchange of passages of speech belonging to two different grammatical systems or subsystems." Grosjean expands beyond two languages by defining it as "the alternate use of two or more languages in the same utterance or conversation" and Heller puts it into a sociolinguistic framework by defining it as "the use of more than one language in the course of a single communicative episode" while Myers-Scotton introduces the idea of matrix and embedded varieties as a selection process for bilinguals or multilinguals (12-14). In Marasigan's model, instrumental and regulatory categories have been collapsed into the "regulatory," and interactional, heuristic, and interpersonal have been collapsed into "interpersonal" (8). In Awang Chuchu's own study of code-switching between Malay, local Brunei dialect, and English in educational settings, she reports that code-switching is an important educational resource. Its motivations or triggers include needing to "facilitate understanding, fill lexical gaps, express emotional feelings, respond, clarify, emphasise, elicit, ascertain, save time and be able to cope with [constraints] and mediat[ing] various speech acts" (268). She also writes that "there are no specific linguistic constraints on code-switching. It happens at all syntactic levels and in all components" (197). This is useful as a way of identifying contexts, resources, strategies, and scope of code-switching. Hess, Aaron. “Critical-Rhetorical Ethnography: Rethinking the Place and Process of Rhetoric.” Communication Studies 62.2 (2011): 127-152. Hess outlines the research methodology of critical-rhetorical ethnography, pointing to the role of researcher as advocate. He draws on Geertz and Conquergood to posit that ethnography is "the capacity to persuade readers that what they are reading is an authentic account by someone personally acquainted with how life proceeds in some place, at some time, among some group" (133) and Brummet to define rhetoric as "in the deepest and most fundamental sense the advocacy of realities" (135). Hess proposes looking at rhetoric as process (in an interactional sense), rather than product (in a textual sense), focusing on vernacular and outlaw rhetorics with the researcher advocating alongside community members. He draws special attention to issues of invention, kairos, and phronesis in order to help the researcher more successfully advocate as a participant observer. He uses the specific example of his involvement in the organization DanceSafe in engaging Rave culture on changing from mainstream War on Drugs abstinence messages to "pro-choice" informed decision-making discourses. Instructor for the Expository Writing Program at the University of Washington and PhD candidate in the English Department's language & rhetoric track. She has previous teaching experience in Chile, Turkey, Kazakhstan, Washington, and Texas. First-Year Composition courses at UW include "Composition through Revolution," "Composition via Mermaids & Other Monsters," and "Multiliteracies and Transforma(c)tions," which is a service learning course.